View the videos below to see what Sun Peaks lodging looks like from the inside and outside! Featuring Stone's Throw (at 0:06 point), Settlers Crossing (at 1:30 point) and Woodhaven (at 2:28 point) townhomes. Find them on the Sun Peaks lodging map below. Unit 10 Stone's Throw - True ski in/ski out condo that backs on to the 16th fairway. 2 bedroom, 2 bathroom condo with heated underground parking, private hot tub and in-suite laundry right next to the new Orient chairlift. Spacious and comfortable 2 bedroom ground-floor home ideal for a family getaway. It has optimal access to downhill and cross-country ski trails. Ski directly to your front door and then enjoy the private hot tub. This 2-bedroom home is warm and bright, perfect for families who want to entertain. You've got a hot tub on your own balcony on the second floor and the Stone's Throw complex is surrounded by trees. With dynamic views, Stone's Throw units allow you to ski in and out directly to the Mt. Morrisey lift. Stone's Throw is one of the newest complexes on the mountain and is adjacent to the Mt. Morrisey connector and chairlift. This bright, open concept two bedroom, two bathroom condo is the perfect place to relax after a day out on the ski slopes, hiking trails or lakes. Soak in the hot tub on your private balcony and take in the mountain surroundings. This is a beautiful and modern open concept two-bedroom home with high ceilings and large windows that allow tons of natural sunlight to shine through. Just off the living room is a balcony with your own private use hot tub. Location, quality, and comfort! 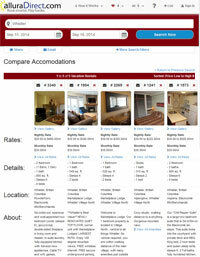 Great value for a hot tub equipped condo! One story, ground floor, unit with a bright light-filled open feeling. Ski in Ski out in the winter and on the 15th fairway in the Summer. Located on the back side of the Settler's Crossing complex, this unit has a wonderful sense of privacy so you can feel truly relaxed on your holiday. The kitchen is open concept with large windows which let in natural light. Private hot tub on your own deck - Settler's Crossing 7 is a cozy home located facing the 16th hole of the Sun Peaks golf course which is also the path to ski in and out to Mt Morrisey. Settler's Crossing 39 is a lovely and bright home that is perfect for small families. As a corner unit, it has easy access to the path just outside of your front door which is your ski-in ski-out location on Mt Morrisey. New furnishings and tasteful decor of this lovely 2 bedroom, 2-bathroom condo will envelop you in luxurious comfort while you relax in front of the fireplace after a day of adventure on the mountain. Featuring Crystal Forest (at 0:06 point) and Trails Edge (at 1:05 point) townhomes. Find them on the Sun Peaks lodging map below. This two-bedroom home is perfect for a family getaway! The kitchen, living room and dining area are all open to each other. Enjoy your own private hot tub to soak in after a day on the hill with a view of Mt Morrisey! Crystal Forest 52 is a cute two-bedroom, two-bathroom home ideal for a family vacation, with plenty of seating and room for entertaining, two wall-mounted flat screen TVs, and a private hot tub that has a view of the new Orient Express chairlift! A prime ski-in-ski-out location, our townhome is exquisitely comfortable, and convieniently located. NO TAXES ADDED! Check us out. Trail's Edge 30 is a spacious and comfortable three-bedroom, three-bathroom townhome with a private hot tub and convenient ski-in/ski-out access to both the Morrisey Lift and the brand new Orient Express, perfect for your family holiday! This home features two fireplaces, one on the main floor living room and one in the den below, and a private hot tub, so you have plenty of choices for where to relax. Featuring Trapper's Landing (at 0:06 point) and McGillvray Creek (at 1:30 point) townhomes. Find them on the Sun Peaks lodging map below. Immaculate 3-level townhome is the perfect escape for extended families who want to entertain. There are 2 bright, spacious bedrooms with 2 ensuites! We can comfortably accommodate groups of 10. Includes a private hot tub! Thank you for searching for Trapper's Landing 13 in Sun Peaks. Luxury ski-in, ski-out 2 bedroom unit with PRIVATE hot tub, deck, laundry, heated tile floors and free wireless Internet access. Take a scroll through Sun Peaks and get feel for the resort using the map below. Hold your mouse over a marker for a description of what you will find there.